Stay away from eating all meat and vegetables that are canned in metal cans as much as possible. Sometimes we are forced to eat them because we do not have any other. Try to get your food canned in jars; or while the food is in season, buy it and can it in glass jars yourself. We should not be asking questions about what kind of foods to eat as much as we should be trying to eat one meal a day. This is where good health and the prolongation of life come from. Good health and the prolongation of life come from abstaining from filling our stomachs too frequently with food of any kind—good or bad. Of this I can assure you from self-experience. If we keep food going into our stomachs only once every 24 hours or 48 hours, and do not get the foolish idea that this cannot be done, then we can train our stomachs to eat once a week and our stomachs will not call for food more than once a week. This has been tried. If we could eat one meal a week, we could live as long as Methuselah. 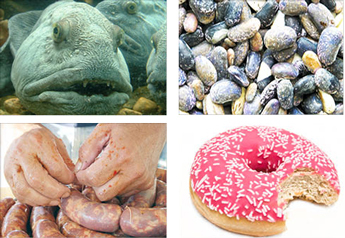 We can get away from eating animal flesh and all kinds of scavenger sea foods. Do not eat large fish that weigh over 50 pounds—such as canned tuna. Sometimes this canned tuna comes from a fish that weighs nearly a thousand pounds or more. Do not eat halibut, catfish, or carp. There is a cheap fish called buffalo (white buffalo) that you can eat. But do not eat any stale fish if you can help it. Even fish is not very good for us, due to their animal-like instincts in the water. But we eat them, and it is not a sin to eat them (edible fish). Many of the bass fish that are found in lakes, rivers, and running stream water are good to eat. White fish, channel trout (which is better), river trout and most perch are good to eat. You may eat fish that weigh from one and a half to four or five pounds. We were reared on the animal flesh that was the divinely-prohibited flesh (the hog). We must not eat or put our hands on the carcass of the hog, or sit around a place where it is being slaughtered or cooked. We should not even get the odor of it in our nostrils. It is a sin to deliberately stand and smell it being slaughtered or cooked. The devil did this harm to you and me and to the people all over the earth. Of course, we cannot blame him for doing this, because he was not created to do righteousness, anyway. Do not think hard of them for anything they do or teach you to do, because they are just doing their job. Nature has made them to be as they are. I pray Allah that He will remove them from the planet earth, so they will not deceive and misguide people from the right way. Eat only one meal a day and do not take food between meals, unless you are sick. A person that is sick and weak is excluded from the above said time of eating. Remember, do not eat those ugly horse beans that you have been eating (lima beans, field peas, etc.). Eat only small navy beans. They are white and pink in color. There are also large beans of the same color, but do not eat the great big beans—eat the small ones. Cook them thoroughly. Feed them to your children. Do not eat freshly baked cakes. Give them a day to dry out, after baking. Do not ever hurry bread to bake, because it is better for us if it has been baked twice. Stay away from eating fried foods. Do not make a habit of filling your stomach with aged cheese. Eat cream cheese as much as possible, it is better for your digestive system. Stay away from eating all meat and vegetables that are canned in metal cans as much as possible. Sometimes we are forced to eat them because we do not have any other. Try and get your food canned in jars; or while the food is in season, buy it and can it in glass jars yourself. If you eat a vegetable meal, try to get fresh vegetables, if you can purchase them from a market. Remember to eat one meal a day, regardless to your type of work. You can live on one meal a day. This will help keep your doctor away from your door. Of course, eating one meal every two days or three days is even better, but you are not going to apply yourself to eating once every two or three days, so try and eat only one meal every 24 hours. Make a habit of this and you will feel better and have fewer ailments.